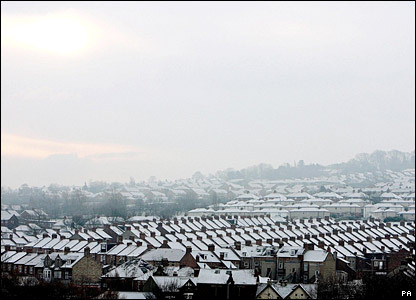 The BBC has a set of pretty pictures from the Great Snow Disaster of 2007.
which has the caption "The sun shines on snow-covered rooftops in Newcastle." Looking out the window here, it is rather brighter. I'd still call it "cloudy" though! Having not been back to the UK in winter for the past 6 years, I must have adapted to the extra photons. Carl's picture of snowmen is good too - hat-tip crandles in the comments here. what?! you're insane! insane! it's sun-drenched!! SUN-DRENCHED, I TELL YOU! !